Fats are making a comeback and thank god! There’s been so much fat-fear mongering over the years, which has caused MORE disease and issues with diabetes, heart health, hormones, weight and cholesterol. I’ve said it before and I’ll say it again… Fat does not make you fat, sugar does! Now of course, if you’re eating fried foods and GMO vegetable oils – these will have a negative impact on inflammation and your waist line, but I’m taking about avocados, nuts, seeds, animal fats, olive oil, coconut oil, ghee, grass fed butter and all the delicious, healthy fats that fuel your brain and hormones. And speaking of hormones, have you tuned into my podcast – Healthy Hormones for Women? I’m super stoked for my podcast and being able to connect with YOU in a new way and to continue to bring you information and inspiration for living a healthy, more vibrant life. If you haven’t yet left a review or a rating, I would ABSOLUTELY love it if you could. Simply head on over to iTunes or Stitcher, leave your review or rating, take a screenshot and email it over to us at – info@holisticwellness.ca and we’ll hook you up with my FREE 3-Day Hormone Balancing Meal Plan ???? This meal plan contains 10 delicious recipes that are low-inflammatory, healing for your hormones and will super charge your energy. 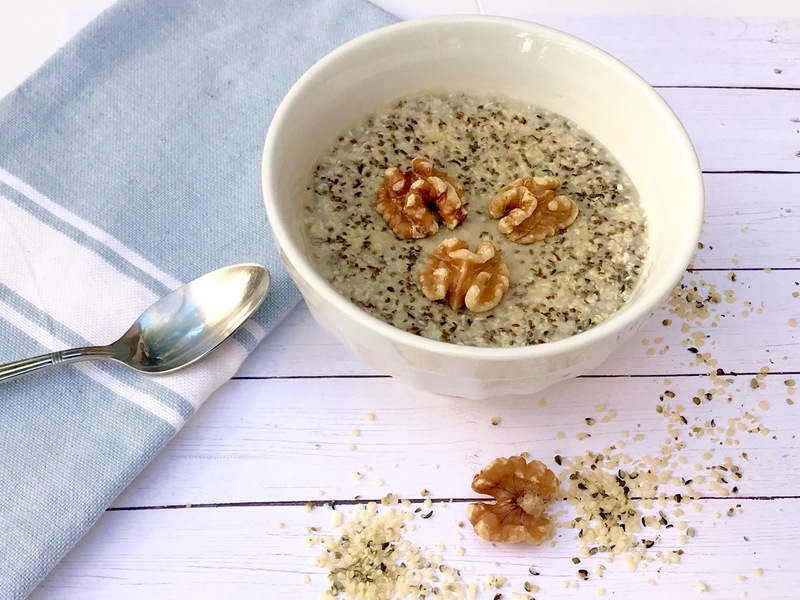 Ok… now back to fats and this delicious and quick breakfast cereal. The ladies in my 12 Week High Fat, Low Carb Program are loving this recipe. I’ve got them loading up on hormone balancing fats throughout the day, ditching the gluten and grains (which are very inflammatory) and shedding fat while eating delicious meals ???????? In addition to this metabolism boosting breakfast, you might like this breakfast scramble recipe here. The bonus of eating fats? It helps to nourish your skin, hair and nails. Ok, let’s get cooking and fuelling our metabolism first thing in the morning. Cuz girl… if you’re still waking up and eating bagels, toast, high fruit smoothies and high carb foods – you are NOT fuelling your metabolism and are in turn, creating an insulin spike, which will cause you to GAIN weight. Make the switch to this breakfast and you’ll start seeing some results! Combine the milk, hemp seeds, ground flax, chia, cinnamon and vanilla in a small pot over medium heat. Stir until boiling. Once it’s boiling, bring down the heat to a low-medium and simmer for about 4 minutes. When the porridge has thickened, remove it from the heat and serve in a bowl. Add the stevia (optional) and top with walnuts.